Being bilingual is difficult. There is no magic solution, no perfect course to follow, no method that we can copy. Our children are not robots who can easily fit into nice little packages. They have their own thoughts, feelings, and desires. Sometimes what we want (as parents or teachers) is not what they want. I guess then, the key to raising a bilingual child is knowing your child, where they are at this moment, and where they want to go. We have to resist our urge to push and set future goals, and sit back and support them in the moment. Know the person they are, not the person you want them to be. Reading stories, in any language, will help the future development of other languages. It doesn't matter if your son is native Japanese, or German, reading them stories in that language will help their development of English. The concepts about books and stories they learn while being read to in French, are the same concepts that they will use when they are learning English. 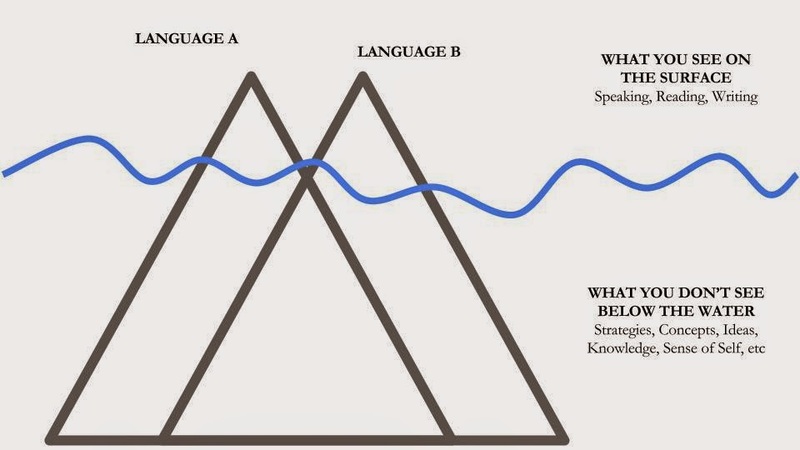 The knowledge that is learned in language A, is transferred to language B. Therefore, the more knowledge we learn in language B, the more we can transfer to language A.
a) If a child is reading a science textbook in Chinese, they are going to learn things about how textbooks work. They have a table of contents, glossary at the back, chapters, titles, subtitles, images, pictures, captions, etc. All of these things give different bits of information that help a person use the book. When looking at the book in Chinese, these ideas are exactly the same as they are in English. They are part of the underwater part you don't seem, but they are incredibly important skills that transfer between languages. b) Imagine a child who is reading a storybook in Korean. They are going to be looking at the pictures and trying to use the picture cues to decipher what the hangul text is saying, using their previous knowledge of stories and pictures to fill in the blanks for the words they can't read or don't understand. Those are skills, and they are the same skills you use in English when learning to read. By reading in one language we pick up skills to use in the other language. 1) Development of the mother tongue is crucial. If we want our children to be bilingual, we have to continue to develop their mother tongue. English at school, Japanese at home. Japanese at school, English at home. 2) Focus on the skills. When working with our children in their mother tongue, make sure they are aware that these skills they are using are transferrable from one language to the other. They can use them in both. 3) Don't think too far ahead. Try not to plan out their future, try to be in the moment with them and figure out what they know, what they like, what they don't know, what they don't like. Be together and teach them where they are NOW, not where you want them to be in the future.